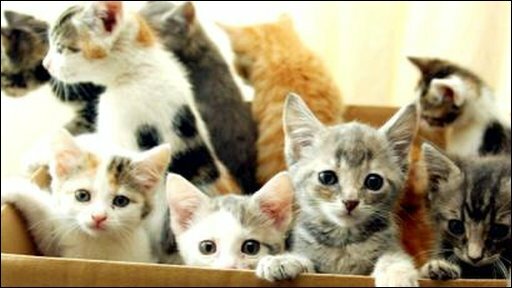 The Scottish SPCA has accused the RSPCA of "stealing food from the mouths" of animals north of the border by taking donations intended for Scotland. The SSPCA has launched a campaign calling for the organisation for England and Wales to stop fund-raising and advertising north of the border. 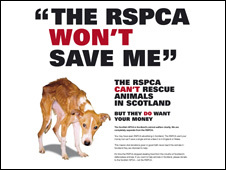 Newspaper adverts warn the public that any donations made to the RSPCA will not save animals in Scotland. The RSPCA insisted it did not deliberately advertise in Scotland. It also said it did not run fundraising campaigns in Scotland where this could be avoided. The Scottish SPCA has taken out full-page adverts in Scottish newspapers calling on the RSPCA to make it clear it does not help a single animal in Scotland. The advert says: "It's time the RSPCA stopped stealing food from the mouths of Scotland's defenceless animals." Stuart Earley, chief executive of the Scottish SPCA, said: "Many people do not know that the RSPCA does not rescue or rehome any animals in Scotland and by advertising here it has been intentionally adding to the confusion to make money. "We are a completely separate charity and have asked the RSPCA to make it clear it does not save animals in Scotland so people can make an informed choice about who to donate to. "However, after six months of talks we are no further forward. This has been increasing the huge pressure on our resources for many years and enough is enough. It's time the RSPCA told the truth." Mr Earley also said the RSPCA received £63m in legacies in 2007. "If just 1% of that was donated by people in Scotland who would rather it helped animals in their own country it would be enough to care for all of the animals we rescue or rehome at our largest rescue centre for an entire year, or all the animals in our small rescue centres for up to six years," he said. Mr Earley added that although this campaign cost £100,000, the money came from cash already set aside for advertising. In a statement, the RSPCA said it went "to great lengths" to ensure wherever possible that adverts were not distributed outside of England and Wales. It said: "Every piece of printed literature, television advertising and internet banner advertising always features the wording 'The RSPCA is a charity registered in England and Wales'. "All Scottish donors, who contact us via RSPCA fundraising campaigns, are directed to the Scottish SPCA so that they can donate to them if they so wish." The RSPCA said it made efforts to avoid fundraising in Scotland but that many satellite channels only enabled the organisation to purchase UK-wide advertising. Nationalist MSP Christine Grahame has called for the RSPCA to transfer all the money it has raised in Scotland to the Scottish SPCA. "There is no difficulty with any charity raising money in one country and spending it in another, if they explicitly make it clear in their campaign and promotional materials that is where individual donations will go," she said. In August 2005, the SSPCA gave itself a new logo which it hoped would prevent legacies being left to the RSPCA. In one case £250,000 was left in a will but went to the English charity. The SSPCA believed the money was meant to be spent on Scottish animals. The new SSPCA logo, highlighted the word Scottish and was changed to black from blue to differentiate it from its English and Welsh counterpart. A merger between the two charities was ruled out because the Scottish SPCA fulfil a semi-judicial status, being a reporting agency to the Crown Office. Surely this is about protecting animals wherever they live? Spending £100,000 on a campaign rather than on the animals they are fighting for? People can donate money to whoever they want, regardless of where they live. I class myself as British but am technically English and support Scottish charities, including the SSPCA. I may be more careful where I put my money in future though as I don't want to pay for silly advertising campaigns - I had hoped to be helping save the lives of animals. Samantha Moore, Warrington, UK. Surely this would be the perfect juncture for the two bodies to merge then? How can either body justify two administrative cost bases when their first priority should be animal rescue? Dave Kerr, Edinburgh. I've watched the adverts on TV knowing that the RSPCA do not help out Scottish animals to see if it mentioned this. It took me three attempts at watching the advert to see that they did indeed say they are England and Wales only but as it was so brief you don't notice it. They either need to find a way to ensure they don't fundraise in Scotland or make sure its clearer on the advertising. A, Edinburgh. It seems sad that any charity would spend hard earned money attacking another doing a similar role, even if the intention is to increase the funds it receives. I cannot imagine people will look on the SSPCA more favourably as a result, and the overall effect may be that both charities receive less money, as the public see precious funds being wasted like this. Phil Hoare, East Molesey, UK. Scotland is a separate government to the rest of Britain so maybe it would be better to keep the charities as separate entities, that seems to be the case anyway - I hadn't heard of the SSPCA before this article so didn't realise there were two charities with similar interests. Carol, Wigan, UK. All I can see here is a huge waste of money. Two sets of management, finance departments, fund raisers, etc etc all aiming to do the same job. I saw the comment saying that the two could not merge, but this seems mad. Ask the question of both groups 'how much do you spend on admin and management each year?' Then work out the savings. I am sure this would be enough to save plenty of animals. Andrew, Wiltshire, UK. Until two years ago I wasn't sure of the distinction, if any, between the SSPCA and RSPCA. I think the SSPCA are correct in raising their profile in Scotland but I'm not sure that going on a full scale public crusade against another charitable organisation is the right move. Hopefully this won't have a detrimental effect on either organisations' incomes. Matt, Glasgow, Scotland.